Peter Morrens and Reinhard Doubrawa understand language and text as an integral basis of their visual work. 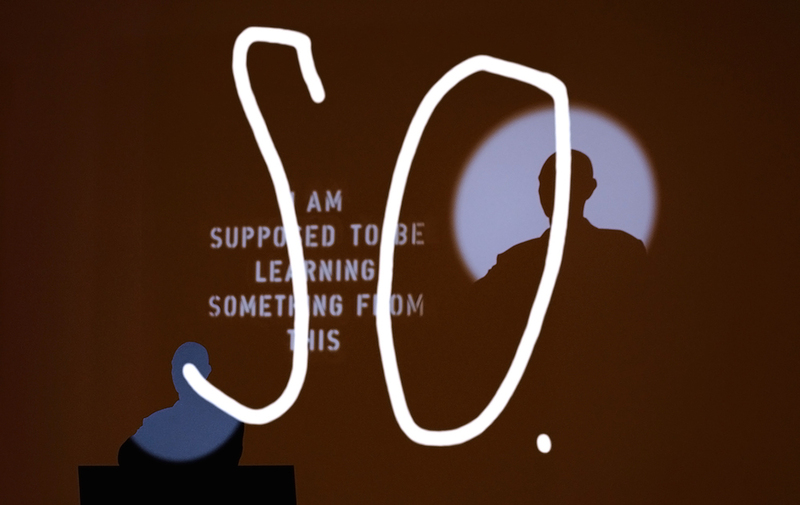 Intheir performance „so“, they use cardboard backdrops and stencils for a shadow theatre. Over the course of the evening, they will permanently react to each others actions using the whole space of the gallery as well as sound elements. By doing so, the constantly create and tear down complexes of meaning in an improvised interplay. Reinhard Doubrawa, born 1963 in Treysa, is an artist and lives in Cologne. He studied at the Academy of Arts Kassel and teaches at various institutions since 1998: Academy of Arts Kassel; TU Eindhoven; Luca School of Arts, Gent; RWTH Aachen; Bauhaus Dessau; Hochschule Bochum; Kask, Gent. Doubrawa works with varying media. In drawings, paintings, photography, objects, graffiti and installation he is concerned with the production of meaning in the context of everyday signs and codes, with the interaction of language, images, action and form. Peter Morrens, born 1965 in Lier, Belgien, is an artist and lives in Antwerp. He studied graphics at Academy of Fine Arts in Gent. Morgens works under different guises and pseudonyms with various projects and media encompassing drawings, photography, installation, performance, text and music. Together with Rik de Boe he ran the art initiative in Lier.